The Marina del Rey Marriott in the heart of one of the most desirable coastal communities in Southern California. The Marina del Rey Marriott is just 4-miles north from Los Angeles Intl Airport (LAX), 3-blocks from the beautiful sandy beaches of world-famous Venice Beach and 2-miles south from Santa Monica shopping attractions. The Marina del Rey Marriott offers easy access to a variety of Los Angeles area highlights, in addition to providing access to over 30 restaurants within walking distance, making our distinctive location an ideal meeting and social destination while offering everything you need to relax or conduct business. The Marina del Rey Marriott has an inviting outdoor lounge and spacious new guest rooms offering panoramic views of Marina del Rey, Southern California coastlines, along with city and mountain views of the entire Los Angeles basin. 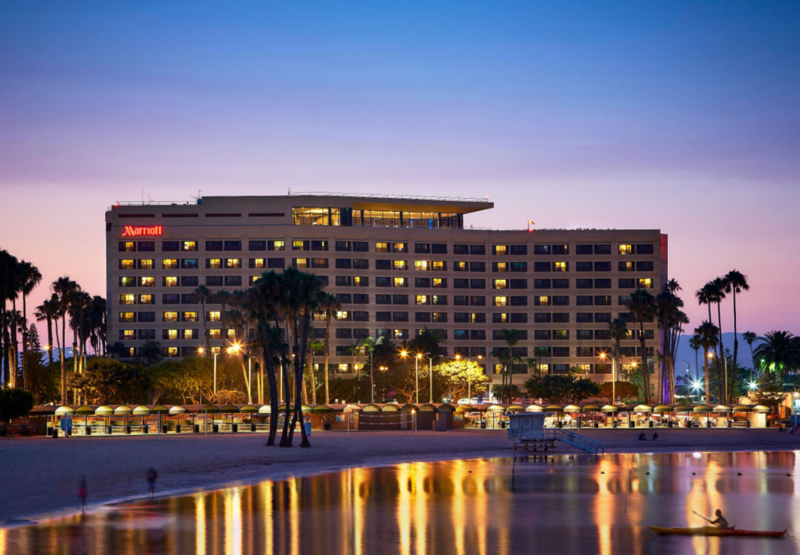 With over 20,000 square feet of space, The Marina del Rey Marriott can accommodate seated meetings of up to 700 guests. In addition to our ballroom venues, they offer a range of smaller rooms for more intimate meetings. Take in great coastal views from open-air balconies and floor-to-ceiling windows from the hotel and in all hotel rooms. Stay productive with high-speed Wi-Fi access. Hotel rooms also offer a spacious desk and a comfortable chair, and there is general space available in the lobby and outside meeting rooms for guests who opt not to stay at the conference hotel. For those that choose to stay at The Marina del Rey Marriott, sleep peacefully on plush mattresses and luxurious bedding during your stay in Marina del Rey. Refresh in a deluxe marble bathroom with a backlit mirror and premium bath amenities in the rooms at The Marina del Rey Marriott. Make use of the flat-panel HDTVs, coffee service, a mini fridge and room service here at The Marina del Rey Marriott.